Arrive Delhi airport / train station. 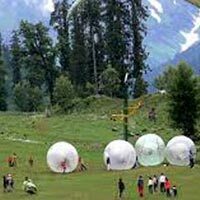 On arrival our representative will meet you and assist you to your transport straight drive to Shimla. Shimla is one of the most popular hill stations of the North. The town is situated at an altitude of 6810 ft, initially chosen as a sanatorium for invalid European officers, but soon developed into a big hill town and became the summer capital of the country. Upon arrival check in to the hotel for Overnight stay. After having breakfast proceed for sightseeing tour of Shimla. Visit Kufri, Kufri is one of the Beautyful place in Suburb famouse for snow in winter time. Later visit Ridge Maidan, Mall Road, and Christ Church. Overnight stay at the hotel. After breakfast drive to to Delhi. On arrival, we transfer you to airport/train station for onward destination.